Shear tool is used to shift one part of an image, a layer, a selection or a path to a direction and the other part to the opposite direction. For instance, a horizontal shearing will shift the upper part to the right and the lower part to the left. A rectangle becomes a diamond. This is not a rotation: the image is distorted. 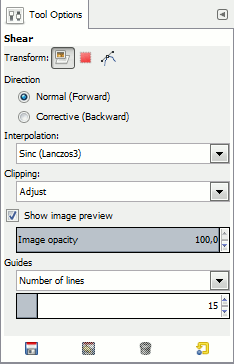 To use this tool after selecting, click on the image or the selection: a grid is possibly surperimposed and the Shearing Information dialog is opened. By dragging the mouse pointer on the image you distort the image, horizontally or vertically according to the direction given to the pointer. When you are satisfied, click on the Shear button in the info dialog to validate. You can't shear both ways at the same time, you have to use the shear tool twice on end. by using the Shift+S key combination. 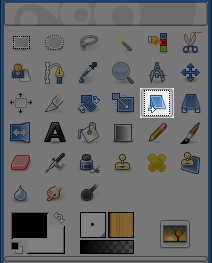 These options are described in Transform tools common options. Here, you can set the horizontal shearing amplitude. A positive value produces a clock-wise tilt. A negative value gives a counter-clock-wise tilt. The unit used by shearing are half-pixels. As above, in the vertical direction.